Soccer is a great game. It teaches many lessons — on and off the field. One of the lessons Staples players learn is how to give back to their sport. Thanks to reserve coaches Russell Oost-Lievense and Reilly Lynch, 10 varsity and reserve Wreckers are spending the spring doing exactly that. They’re working with younger boys and girls in Bridgeport, just a few miles away. Russell organizes the soccer component. Last year, 8 Staples players volunteered at the Cesar Batalla School. 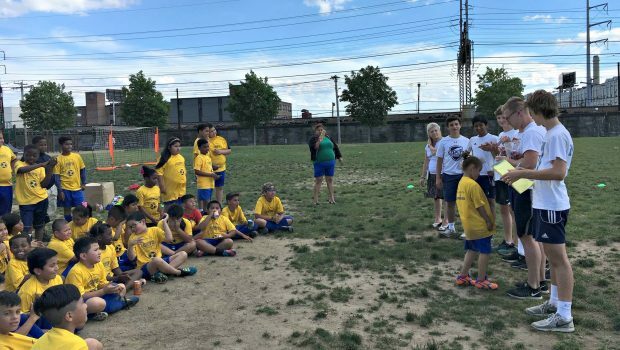 Twice a week for 8 weeks, they helped 60 boys and girls learn to play and love soccer. They also mentor the kids. Emerson Anvari, Surya Balaji, Carter Bassler, Colin Corneck, Josh DeDomenico, Sam Liles, Brendan Lynch, Patricio Perez Elorza, Enzo Valadares and Callum Wisher are the Staples players involved. Former player Vignesh Kareddy also participates. Of course, it takes money — for equipment, transportation and more. Click here for a GoFundMe page. Any help from the Staples soccer community is greatly appreciated. 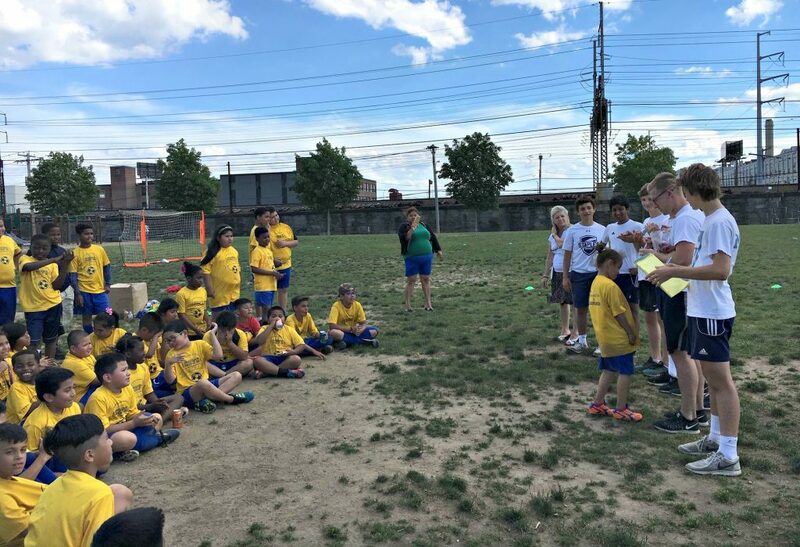 From left: Sam Liles, Vig Kareddy, Callum Wisher, Russell Oost-Lievense and Brendan Lynch, with their eager young players in Bridgeport. Ana Simunovic is at far left.